Brown with Colour China - 117 items found. A lovely large dish printed in brown with subtle terracotta and yellow highlights. Backstamp: Impressed Davenport with anchor and 48 and in script 868. Crazed with a little minor discolouration on the back otherwise excellent condition. A lovely large dish printed in brown with subtle terracotta and yellow highlights. Backstamp: Nankin Davenport, impressed Davenport with anchor and 43 and in script 868. Crazed with a little discolouration but this is mainly on the back otherwise fine. Delightful pattern on this box, brown printed with added hues of green and teracotta. Backstamp: Printed Davenport and impressed Davenport over anchor with impressed date for 1860? A little minor discolouration inside and just a touch of wear to the ochre rim otherwise excellent condition. Brown with a little added hand applied enamel colour. Different view either side. Excellent condition. This is the large Turkey platter printed in brown with added colour. A few signs of wear but otherwise excellent condition. Printed in brown with added colour. Excellent condition. Very pretty teapot with fluted detail to the body. Backstamp: Mill Stream Made in England by Johnson Bros A Geniune Hand Engraving All Decoration Under The Glaze. Detergent & Acid Resisting Colour Pat Pen. A small firing fault around the base of the finial, otherwise excellent condition. Pretty bowl with fluted detail to the body. Backstamp: Mill Stream Made in England by Johnson Bros A Geniune Hand Engraving All Decoration Under The Glaze. Detergent & Acid Resisting Colour Pat Pen. A little minor surface scratching inside otherwise excellent condition. Very attractive dish with fluted detail to the rim. 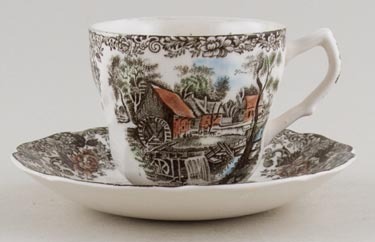 Backstamp: Mill Stream Made in England by Johnson Bros A Geniune Hand Engraving All Decoration Under The Glaze. Detergent & Acid Resisting Colour Pat Pen. Excellent condition. Very attractive dish with fluted detail to the rim and cover and pattern inside the base and to the cover. Backstamp: Mill Stream Made in England by Johnson Bros A Geniune Hand Engraving All Decoration Under The Glaze. Detergent & Acid Resisting Colour Pat Pen. Excellent condition. Very pretty cup with fluted detail to the body. Backstamp: Impressed Made in England. Minor signs of wear, overall excellent condition. Very pretty cup and saucer with fluted detail to the body of cup and rim of saucer. Backstamp: Mill Stream Made in England by Johnson Bros A Geniune Hand Engraving All Decoration Under The Glaze. Detergent & Acid Resisting Colour Pat Pen. Light crazing to the saucer otherwise excellent condition. Very attractive plate, with embossed detail to the rim. Backstamp: Johnson Bros Made in England Old Britain Castles and on the front Ruthin Castle in 1792. Excellent condition. 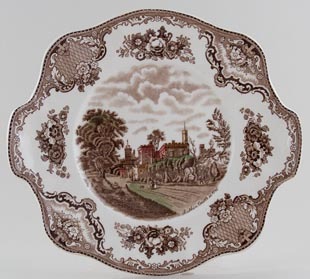 Pretty little dish featuring Westminster. Excellent condition. Delightful little sugar on four small feet. Would originally have had a lid, but a lovely piece on its own. Backstamp: Impressed Made in England. Brown printed under the glaze with hand applied enamel colour. Attractive shape platter in excellent condition. Brown printed under the glaze with hand applied enamel colour. Attractive shape in excellent condition. Base only, which is beautifully decorated inside. 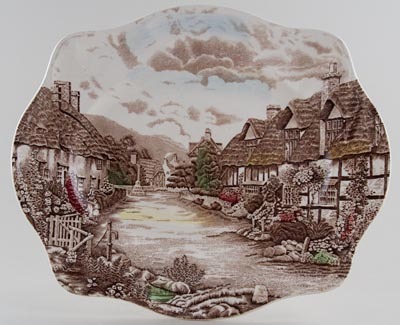 Backstamp: Olde English Countryside Made in England by Johnson Bros A Geniune Hand Engraving All Decoration Under The Glaze Detergent & Acid REsisting Colour Pat Pend. Excellent condition. Pretty bowl pattern to the inside only. Cover has cut out for ladle. Tureen beautifully patterned inside and on the cover. Brown printed under the glaze with hand applied enamel colour. Excellent condition. Minor signs of wear, overall excellent condition. Brown printed under the glaze with hand applied enamel colour. The rim shows signs of wear otherwise fine. Wavy rim dish with fluted rim, features "The Village Green"
Pretty wavy rim dish, lacking a lid. Pattern to the rim and inside only. Features "The Covered Bridge"
Sugar Maples. One has minor nick to rim. Wavy rim plate featuring "Willow by the Brook"
Wavy rim plate featuring The School House. Features The Covered Bridge. Wavy rim bowls with fluted rim. Excellent condition. Delightful little jug with fluted detail to the body. Backstamp: Impressed Made in England. Excellent condition. Lovely hexagonal caddy. Backstamp: Masons's Patent Ironstone China Fruit Basket England Guaranteed Detergent Proof & Acid Resisting Colours. Crazed otherwise excellent condition. A good sized tray with moulded side handles, printed in the traditional brown of Mandalay with bold blue hand painted highlights. Lare boat shape dish in superb condition. Brown printed under the glaze with the blue decoration hand applied. Usual brown printed Masons mark, Patent Ironstone beneath the crown, Mandalay England. This was originally a stand for a sauce tureen however is a lovely piece on its own. Excellent condition. Lovely blue and ochre decoration on a cream body. Small chip to rim otherwise fine. Lovely octagonal jug with hydra handle, blue and ochre decoration on a cream body. Backstamp: Mason's Patent Ironstone China England Mandarin. Excellent condition. Extremely pretty jar decorated in lovely colours. Backstamp: Mason's Patent Ironstone China Nabob England and in script C4830 6. A touch of crazing and a small hairline to the neck of the jar otherwise excellent condition. Very pretty plate with indented rim by William Smith of Stockton on Tees. Backstamp: Fruit Basket W S & Co and impressed W S & Co Wedgewood. (An injunction was taken out in 1848 preventing the use of Wedgwood on Smiths wares, whatever the spelling). Crazed and underneath there is a small rim chip and a little discolouration. Superb platter in excellent condition. Impressed date for May 1940. Tureen with fluted body standing on decorated foot. Lid has cut out for ladle. In excellent condition. Delightful little cup and saucer with basketweave decoration around the rim of the saucer and cup. Backstamp: Copeland Spode England Buttercup. Pretty cup and saucer. Both pieces have embossed basket weave decoration around the rim. Excellent condition. Backstamp: Seal mark Copeland Spode England Buttercup. Very pretty plate with embossed basket weave decoration to the rim. Excellent condition. Backstamp: Seal mark Copeland Spode England Buttercup. Brown printed under the glaze with hand applied enamel colour. Same lovely rural scene either side of the body with grapevine board around the rim and along the line of the handle. Backstamp: Copeland Spode England Spode's Byron. Tiny blemish inside otherwise excellent condition. Brown printed under the glaze with hand applied enamel colour. Same delightful rural scene either side of the body with lovely grapevine border around the rim and along the line of the handle. Backstamp: Copeland Spode England Spode's Byron. A little very minor wear underneath otherwise excellent condition. Brown printed under the glaze with hand applied enamel colour. 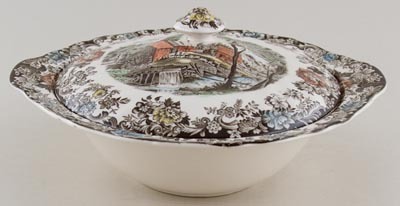 Same lovely rural scene either side of the body with grapevine border around the rim and along the line of the handle. Backstamp: Copeland Spode England Spode's Byron. A little minor wear to the handle otherwise excellent condition. Lovely small pot with same delightful rural scene either side of the body and lovely grapevine border around the rim of pot and cover and along the line of the handle. Backstamp: Copeland Spode England Spode's Byron. Excellent condition. Lovely pot with same delightful rural scene either side of the pot and lovely grapevine border. Backstamp: Copeland Spode England Spode's Byron. Excellent condition. Brown printed under the glaze with hand applied enamel colour. Two different rural views either side of the body with grapevine border around the rim. 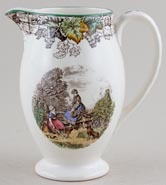 Backstamp: Copeland Spode England Spode's Byron. Excellent condition.